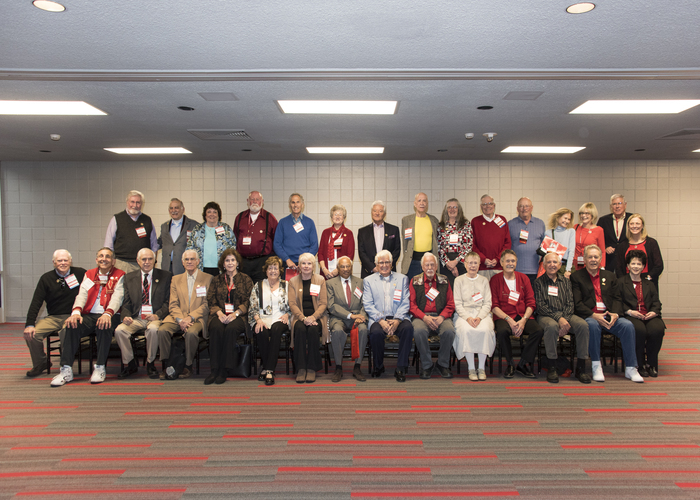 The Founders' Day 50-year club, class of 1966, is enshrined at the outset of CSUN's Homecoming festivities. Photo by Lee Choo. The Founders' Day 50-year club, class of 1967, is enshrined at the outset of CSUN's Homecoming festivities. Photo by Lee Choo. 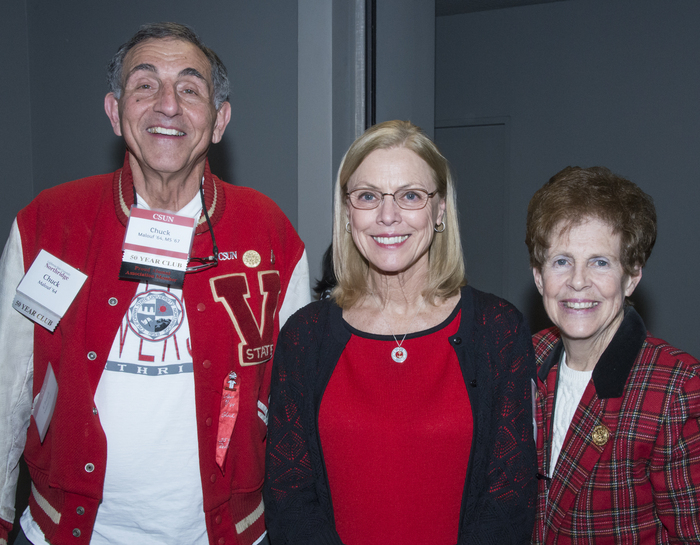 CSUN President Dianne F. Harrison with members of the 50-year club. Photo by David J. Hawkins. 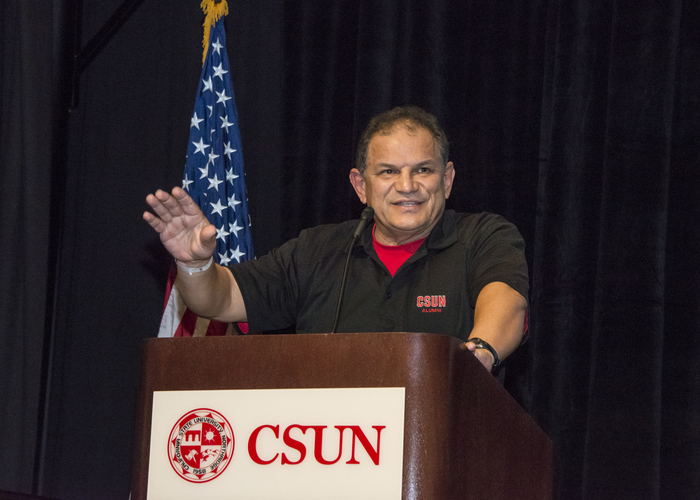 CSUN Alumni Association President Carlos Fuentes addressed the crowd. Photo by David J. Hawkins. 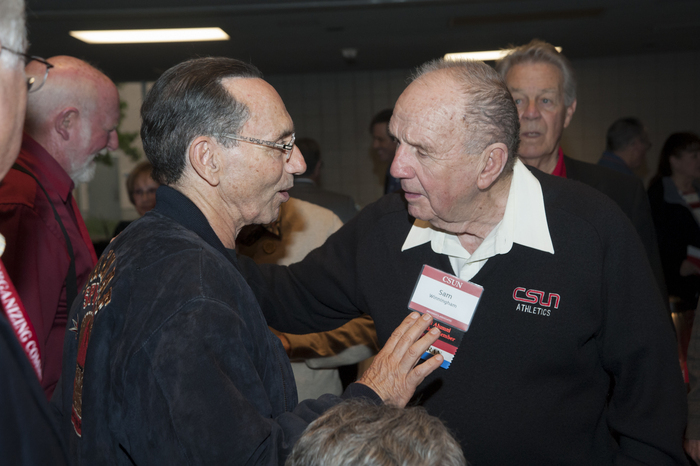 Sam Winningham (right), who coached CSUN in the Jr. Rose Bowl in 1967, was one of the honored attendees at Founders' Day. Photo by David J. Hawkins. The Marilyn Magaram Center was well represented at Homecoming. Photo by David J. Hawkins. The Matador Motorway, presented by Lincoln Motor Company and Galpin Lincoln, was a big hit with participants and fans alike. Photo by David J. Hawkins. The Homecoming enthusiasm extended to the crowd during the Matadors' 77-55 victory over UC Santa Barbara. Photo by David J. Hawkins. A blow-out basketball victory. Good friends remembering old times. Photo-finish races. Great food and music. Eyes widened at a campus that has changed significantly in the past five decades. 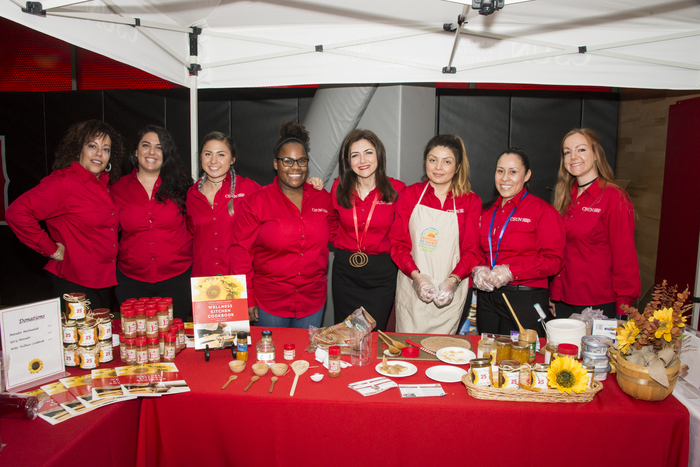 These were the scenes of the 2017 California State University, Northridge Founders’ Day and Homecoming, the first all-alumni gathering in nearly a decade. 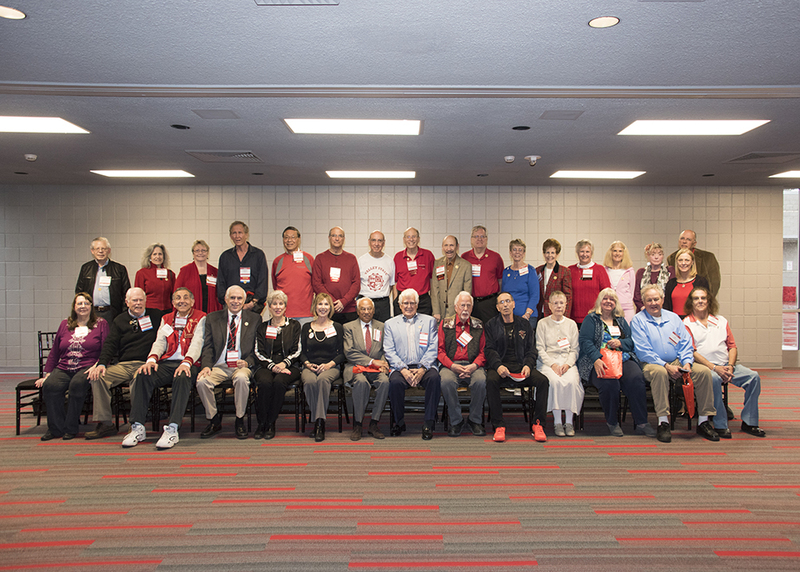 Alumni from the classes of 1966 and 1967, as well the faculty and staff who began their employment at CSUN during those years, came together for an afternoon luncheon and induction into CSUN’s 50-year Club. 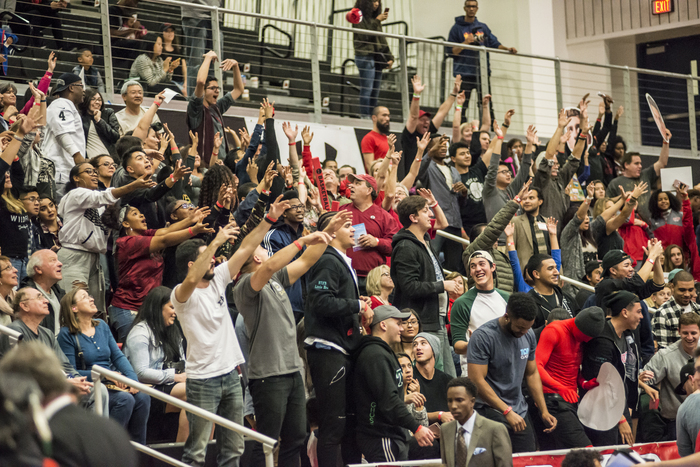 Afterward, they joined hundreds of other alumni, students, faculty and staff at Homecoming, culminating in the Matador Men’s Basketball team win over the UC Santa Barbara Gauchos in front of a packed Matadome crowd Saturday. “Just like past times of political and social change, we have come together as a campus community — regardless of opinions and beliefs,” said CSUN President Dianne F. Harrison, speaking at the Founders’ Day luncheon, which kicked off the Homecoming festivities. Harrison spoke of the parallels between the challenges faced by today’s CSUN students and those encountered — and overcome, during the 1960s — by the university’s 50-Year inductees, affectionately known as “Valley Staters,” who graduated in 1966 and 1967 from San Fernando Valley State College (CSUN’s name until the early 1970s). “I have strongly signaled that this university is committed to supporting all of our students, regardless of race, regardless of ethnicity, regardless of religion, gender or politics,” Harrison said. The Founders’ Day luncheon — a longstanding tradition at CSUN where alumni are inducted into the university’s 50-Year Club at an annual, on-campus celebration — welcomed 56 members of the classes of 1966 and 1967, as well as seven faculty members who began teaching at CSUN during those years. “These gatherings are such fun and a great chance to look back at our heritage,” Harrison said. Babara Levy-Preston and Gil Preston were one of two husband-and-wife teams who were inducted into the 50-Year Club. Gil transferred from another university in 1966 to join his then-girlfriend, Barbara, at Valley State. Two months after Barbara completed her degree in 1966, the couple married. Gil graduated in 1967. “[CSUN] was my gateway to my life,” said Barbara, a retired educator. After the luncheon, alumni and their families made their way to the award-winning Student Recreation Center. The SRC hosted the bulk of the Homecoming festivities on its second floor – in the Red Ring Courts and Matarena basketball/volleyball courts. 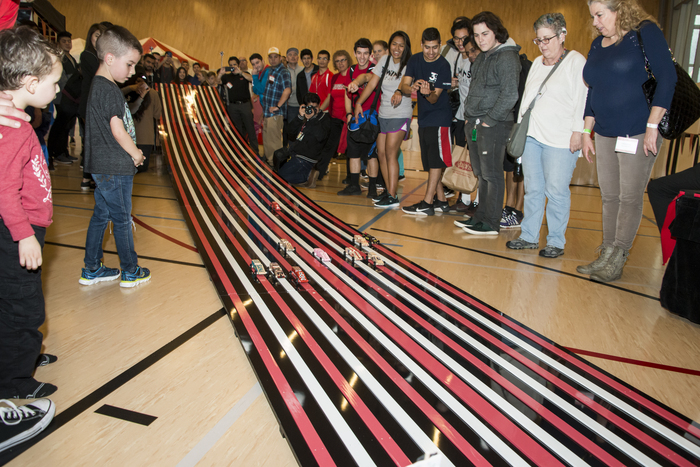 The day included pinewood derby races at the Matador Motorway, presented by Lincoln Motor Company and Galpin Lincoln — a 42-foot long, vinyl, red-and-black ramp — a barbecue and kids’ buffet, kids’ carnival games, crafts, tours and the Men’s Basketball game in the evening. In the Red Ring Courts area, alumni also enjoyed tasting the Matador Red ale from alumni-owned and Valley-based 8One8 Brewery, and checking out demonstrations by popular and inspiring CSUN programs such as 3 Wins Fitness. The community initiative, organized and run by students in the Department of Kinesiology, brings undergraduates to public parks in the Valley and around L.A. to run free fitness classes for area residents. CSUN students are working to replicate the program around the state. CSUN students also demonstrated their award-winning apps from the campus’ annual AppJam competition. Alumnus and new 50-Year Club inductee Marc Schneider ’66 (Psychology) grinned from ear to ear as a student guided him through a test run on the virtual-reality painting app, Tilt Brush. Schneider wore a virtual-reality headset (dubbed a “VR box”) and tried his hand at “painting” while other alumni watched his handiwork on a computer monitor. Tilt Brush is just one of the apps CSUN students have created to enhance classroom teaching and try to develop new 21st-century learning tools. The most memorable facets of Homecoming for most alumni, however, were the human connections — and reconnections. Many alumni noted that they had not returned to campus for years, or even decades. As they sat together at themed tables or caught up with one another at mini reunion gatherings for programs and groups such as journalism, Associated Students, USU, Matador Motorsports, recreation and tourism management and leisure studies, and a host of fraternities and sororities, alumni from six different decades embraced, took selfies and swapped old stories. “Who’s excited about being a Matador tonight?” he shouted, eliciting a roar from the alumni and cheers from the Matador Band and cheerleaders. “I’m delighted to be here with our Matador family. 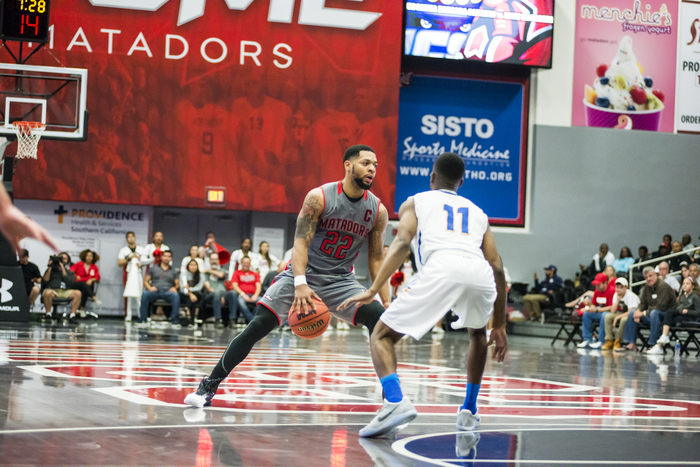 The 77-55 win was the perfect end to CSUN Homecoming.